Hi there friends and fellow crafters, Happy World Card Making Day 2017!!! Today I am here with a fun project the team worked on together. The idea behind the project was each member decorated a 3" x 3" square and then cut it into 1" x 1" squares and mailed one to each member of the team and kept 1 for themselves. Once the "inchies" were received we made a card using them in one way or another. This was quite a fun project to work on with the team, and really goes to show how we work well together given the fact most had the same idea for which set to use. Unfortunately I am traveling and 2 of the "inchies" did not arrive for me to use in my project. 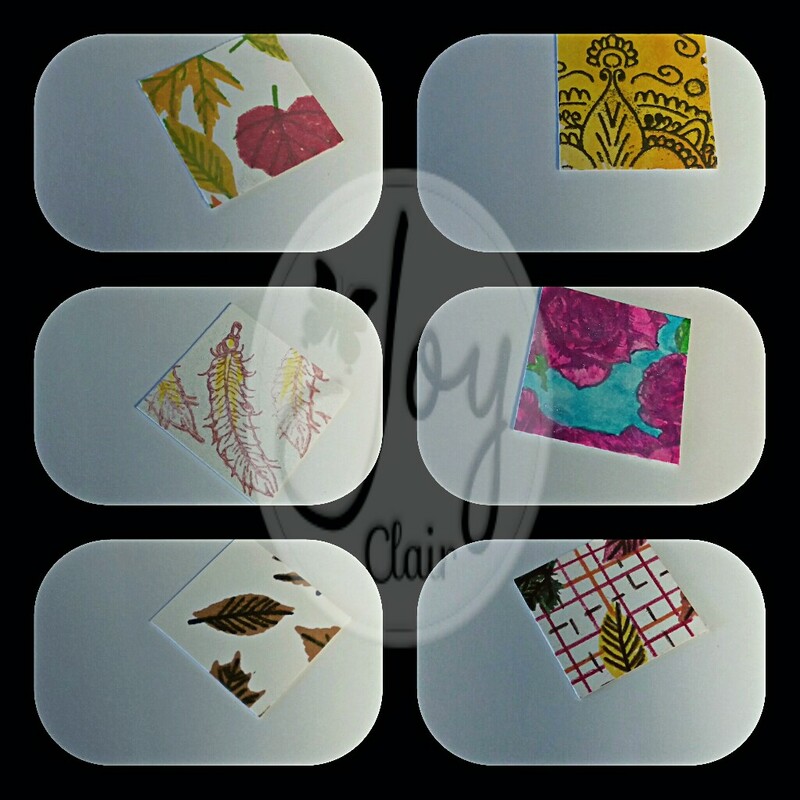 In order to create this project I personally used 3 of the Joy Clair stamp sets. I used the tree from Happy Halloween, the grass sprouts from If You Dare, and the mummy from October Fun. Bamboo Leaves for the Grass Sprouts and Summer Sky for the sky background. I then used Tear Tape to adhere the inchies to the base, some to simulate the tree leaves, and one to act as the Halloween bag for the little mummy child. 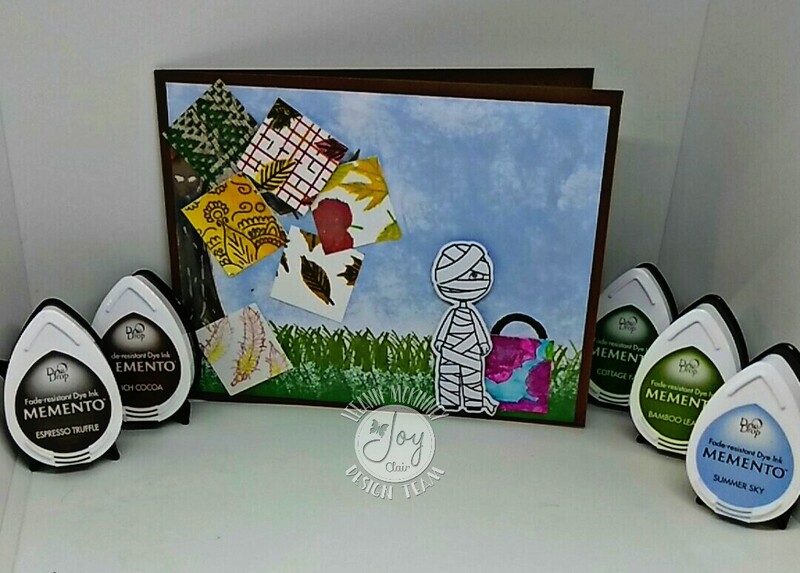 The mummy is attached using foam squares as is one of the inchies for added dimension. I do hope you enjoyed this project today as much as I had fun making it. Inchies not received by the time this project was created will be used in a future project. Comments close at 23:59 EST on 7th October 2017. 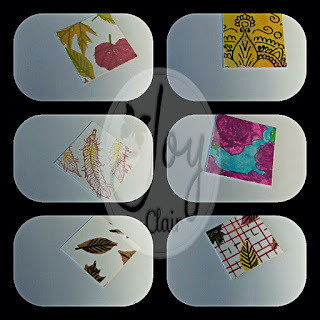 Don't forget that we have a lot more going on throughout today on Joy Clair blog too! We hope to see you back here for the rest of the events - there will be lots of opportunities to be inspired and to get crafty with us! Love that mummy! And how you used your inchies too. Such a great scene - love it! Very unique and great!!! I love you card and love to share my day with you!!! Hugs! Thank you Martha, only one way that day would have been any better... NEXT YEAR, the 3 Amigo's together!!! LeeAnn, that is spooky cute! Thank you Helen, had to think out of the box. The mummy concept is fun! Sorry my inchie went to the wrong place. adorable way to use these! Thank you Char, a fun project for sure. Thank you so much Arianna. Very creative! I would never have thought to use the inchies as fall leaves! 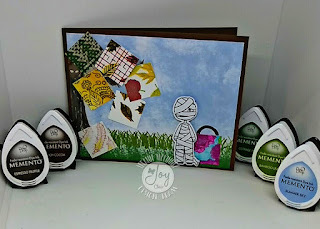 Great idea and your card looks amazing with all the extra details you incorporated in it! Super fun card! Such a great way to interpret the challenge and use the inchies for the fall leaves! Great design too!